Entrepreneur brings back legendary childhood toy. The days of tassels on your handlebars and the crackling sound of plastic wheels careening across the ground are back. 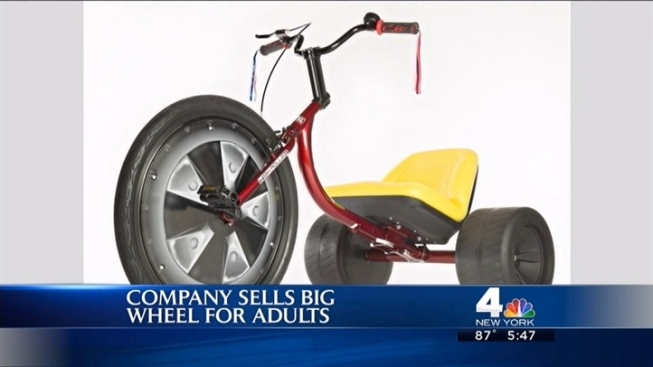 High Roller USA has designed an adult "Big Wheel" that comes with everything from a comfy 4-inch plush seat and of course, a huge 26-inch front wheel and two 14-inch back wheels for drifting. The company's main bike, the High Roller, sells for $599.99. Replacement wheels, which you will need if you plan to truly reclaim your youth after a few power slides, are $89.99. Former aerospace engineer Matt Armbruster designed the trike and raised $89,000 on Kickstarter.com in order to get the product on the assembly line. The bike, according to the High Roller website, supports "kids" of all sizes, ranging from 5’2″ to 6’6″ and up to 275 pounds. Armbuster says he's already sold 300 of them. "Everyone wants to tell me their Big Wheel story," Armbruster told USA Today. "I'm happy to listen." The High Roller will have competition next year as well. "Big Wheel" brand owner Jakks Pacific is planning their own model, which will run for about $400, for release in 2014.